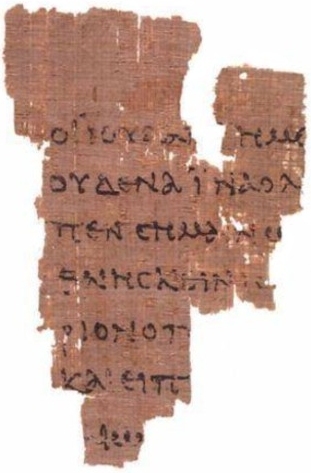 This earliest papyrus fragment from a Greek codex of John’s Gospel is about the size of your hand. The front (pictured) contains parts of John 18:31-33, and the back is from 18:37-38. It was copied sometime during the first half of the 2nd century, possibly during the reign of Emperor Hadrian (117-138 CE). Named the Rylands Papyrus 52, it is displayed at the John Rylands Library in Manchester, England. For God so loved the world that he gave his only begotten Son, that whoever believes on him shall not perish but have everlasting life. If you grew up in a Bible-believing church, you know John 3:16 by heart. Another familiar term occurs in 3:3, where Jesus tells Nicodemus he has to be “born again” to enter God’s family. People used to hand out tracts on city streets and ask people if they were born again. Perhaps they still do. Do any of them notice the female imagery? The birth-giving Spirit is our Mother. I chose this Gospel for our second lesson series because I think it is the most thoroughly feminist writing in our New Testament. Most Christians don’t know that—but all the more reason to get acquainted with this tough, tender, mothering Jesus who befriends women as well as men. We won’t focus only on a feminist approach, however. This Gospel is rich beyond measure, saturated with imagery from the Hebrew Bible, theologically radical, and fertile ground for the use of literary, social-science, and political analysis. I will only scratch the surface and depend on readers for additional insights. All four canonical Gospels are anonymous. Names of original apostles or apostles’ companions were attached to them in the second century to identify these writings as authoritative at a time when other Gospels and fanciful stories about Jesus were proliferating. Matthew and John were two of Jesus’ disciples, Mark was a companion of Peter, and Luke sometimes accompanied the Apostle Paul. Some traditions trace the four Gospels to various Christian communities in Rome, Antioch, or Ephesus. The process of canonizing our 27 New Testament books took several centuries, but the Synoptic Gospels—Matthew, Mark, and Luke—were shoo-ins. Though some thought John too Gnostic, it was ultimately considered orthodox. Few scholars today believe John the disciple authored this Gospel. Many incidents are set in Judea and Jerusalem, foreign territory for a Galilean fisherman. Though the simple Greek points to an author using it as a second language, the literary skill and use of Old Testament material points to someone with significant education. The “beloved disciple” (3:23, 19:26, 20:2, 21:7, 21:20) must be the author, but s/he clearly wants to remain anonymous. I will refer to “John” for the sake of brevity—but please think of “John” in quotes! Reading Matthew, Mark, and Luke, it is obvious that they have a literary relationship to each other. Some texts read almost word-for-word, as when Jesus blesses the children (Matthew 19:13-15; Mark 10:13-16; Luke 18:15-17). Over 90 percent of Mark’s material is included in both Matthew and Luke, so Mark was likely written first, around 65-70 CE. As Mark circulated, Matthew and Luke copied and edited large chunks of Mark, perhaps by the 80s of the first century. John, however, is independent of the other Gospels, in both writing style and much of its content. Here Jesus’ ministry lasts for three years, rather than only one year in the Synoptics, and he visits Jerusalem several times before his death. The Synoptics show that Jesus was executed because he disrupted the temple treasury that same week, but John places this act of civil disobedience at the beginning of his ministry (2:13-25). In the Synoptics, Jesus is crucified on a Friday, but John’s Jesus is crucified on the Thursday of that week for literary and theological reasons we’ll discuss later. Lest some readers are troubled by such striking discrepancies, we are greatly helped by an interpretive approach called “narrative criticism.” All four Gospels tell one story of Jesus, but they each develop their own narrative with distinct plots. A plot demands certain characters, settings, and reorganizations that are necessary for that plot. Using narrative criticism, you will find that the plot within each Gospel narrative carries the deepest theology of its author. Click on the image to open a printable diagram. 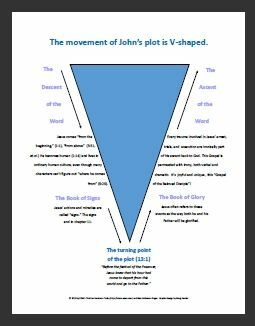 “The Descent of the Word” (the first twelve chapters). 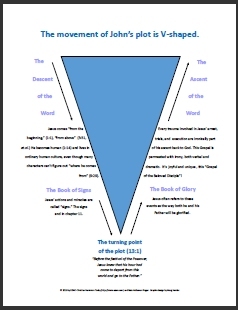 “The Ascent of the Word” (chapter 13:1 through the end of the book. The words, “Before the festival of the Passover, Jesus knew that his hour had come to depart from this world and go to the Father”(13:1) mark the turning point. The rest of the book from that point on— including every trauma involved in Jesus’ arrest, trials, and execution— is ironically part of his ascent back to God. We can also think of subtitles for this two-part division because something else is happening within both the Descent and Ascent sections. The first eleven chapters of John’s gospel can be called “The Book of Signs” because they present Jesus’ actions and miracles, which are called “signs.” The events after the “signs” comprise what may be called “The Book of Glory,” because Jesus often refers to these events as the way both he and his Father are glorified. As these titles suggest, this Gospel is permeated with irony, both verbal and dramatic. Future lessons will highlight many of these profound but often hilarious ironies. I invite you into the joy of this unique “Gospel of the Beloved Disciple”! 1. What is your history with the Gospel of John? If you have a church background, how was it used in worship, study, or evangelism? Do you recall any special verses? 2. What ironies or woman-friendly texts have you previously noted in this Gospel? 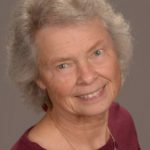 As someone who gave out tracts on street corners in my youth, and in my middle years realized that “born again” really is female God-language, I profoundly appreciate what you are doing with the Gospel of “John.” Thank you so much, Reta! Oonce again I learn so much from you, even in this introduction. I was totally ignorant of the history of this gospel. I always learn new things from a new perspective from you. I am eagerly awaiting the next lesson. 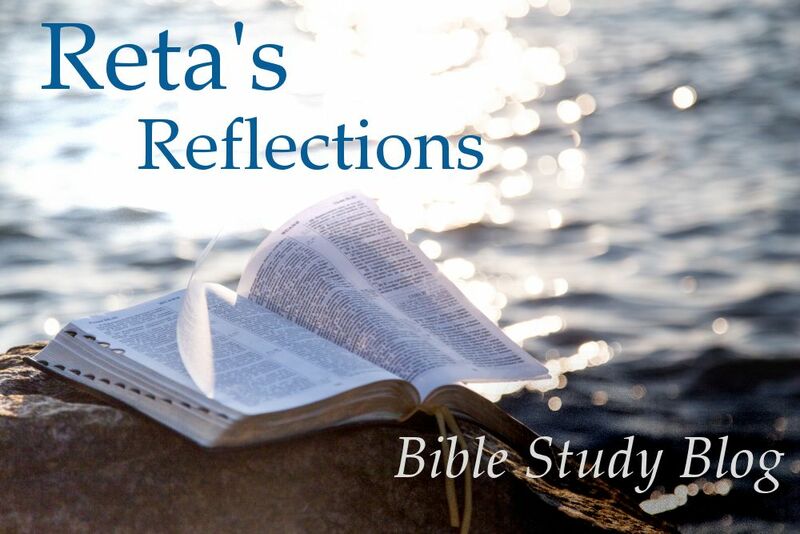 Thank you for your outstanding scholarly work in this introduction and in all your biblical studies, Reta! I will always be grateful for your work in “Daughters of Sarah” that fed my Christian feminist spirit for many years. I have a question. One of the main reasons people argue that faith in Christ is rational is because of historical fact (or really more like historical non-refutation of story). Jesus lived, they say, and died as he did in the Bible. Research has yet been unable to refute the crazy stories presented in the Bible, which is, they say, a powerful argument for the truth of the stories in the Bible. QUESTION: If you have to read the Gospels with narrative criticism because they don’t line up with each other– how does that relate to the “historical argument” for Christ? To answer your question, I was assigned an interesting experiment in my secular University course on religions/philosophies. We had to create the general tenants of a religion based merely on one of the Gospels. My group got “John”. We learned that it was very hard to develop guidelines for life from the book of “John”. It is such a deeply contemplative and philosophically rich work of mind-bending material. Morielle, your question about narrative criticism and historical reality is a good one. A short answer would be that “poetic license” sometimes communicates truth more forcefully than a rigid account of “just the facts.” Each author puts his/her own spin on the story of Jesus’ life, as do any historians. That’s why, I suppose historians often tackle their own biographies of a great person of the past, even tho many others have already tried. I understand what you mean about John. It reads more like Thomas Merton or Julian of Norwich than Martin Luther King or Sojourner Truth. However, now that I am probing this Gospel more intently than probably ever before, I’m finding new emphases–not only because I’m focusing more deeply but also because I am at a different place in life and am looking for different things. Hang in there with these lessons, and you may find aspects of Jesus you didn’t know were there! PS. In terms of cold, hard facts, we probably know more about Jesus than we do of most characters from the Greco-Roman world of the same era. Thanks for the answer, Reta! Do you know of any good books on the topic? I want to learn more about the cold, hard facts we know! Sorry I didn’t check your question sooner. There are many commentaries on the Gospel of John, most of which I have not read. Raymond Brown’s is not a recent one, but very solid and full of information–“cold,hard facts”! The one I used in a college class is the Cambridge Commentary on John by Jerome Neyrey, using a social scientific approach. Students seemed to enjoy that one, as I do. One caveat: although he sees women being accorded high status in this Gospel, he’s enough of a Roman Catholic that he draws the line on their authority in the church–which I think is a wrong conclusion.